Hello, friends! 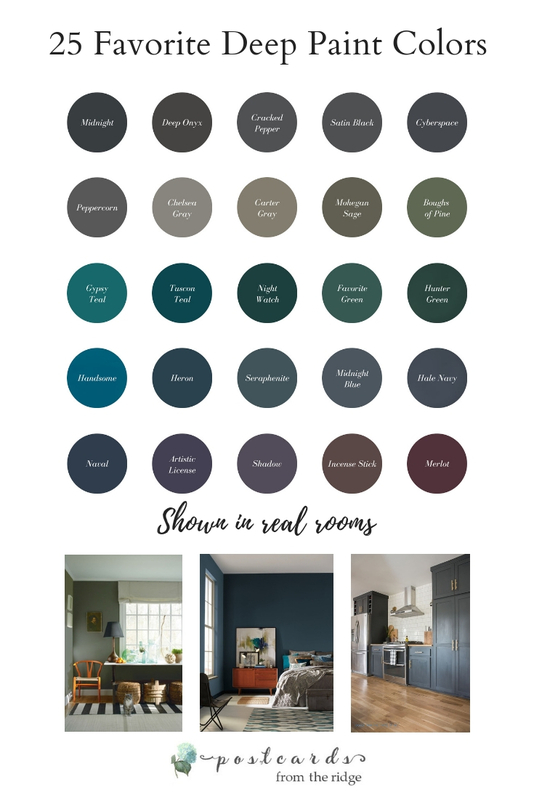 Have you noticed all of the dark paint colors that are appearing in magazines and design websites lately? They're everywhere and they're gorgeous! If they've caught you eye too and you want to see more, then you've come to the right place! I'm featuring over 25 deep, moody colors for to inspire you for your next painting project. There are blues, greens, blacks, purples, grays, and more so be sure to scroll all the way through to see them all. And let me know which one is your favorite! PLEASE VISIT EACH SOURCE AND PIN FROM THOSE PAGES. 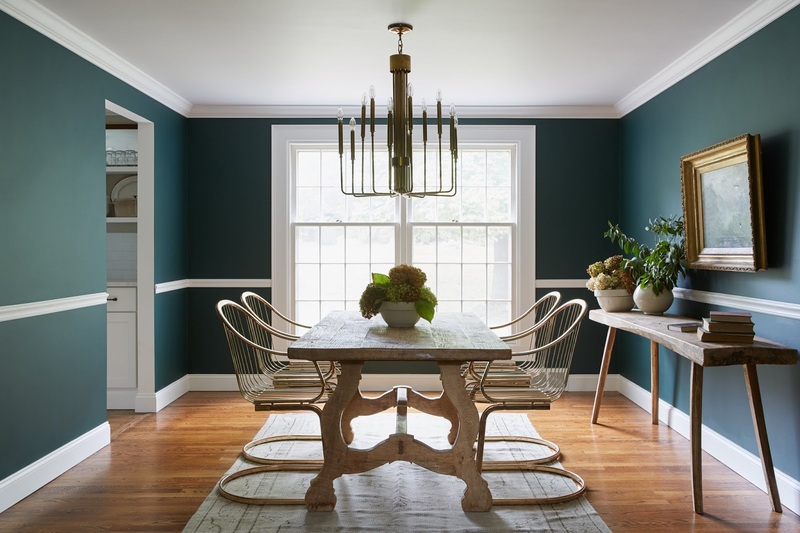 Here's a gorgeous dining room painted with PPG's color of the year, Night Watch. It looks great with the white trim and natural wood floors. Add drama and flair with Benjamin Moore Shadow. Wouldn't it be pretty at night? It was the color of the year in 2017 for Benjamin Moore. 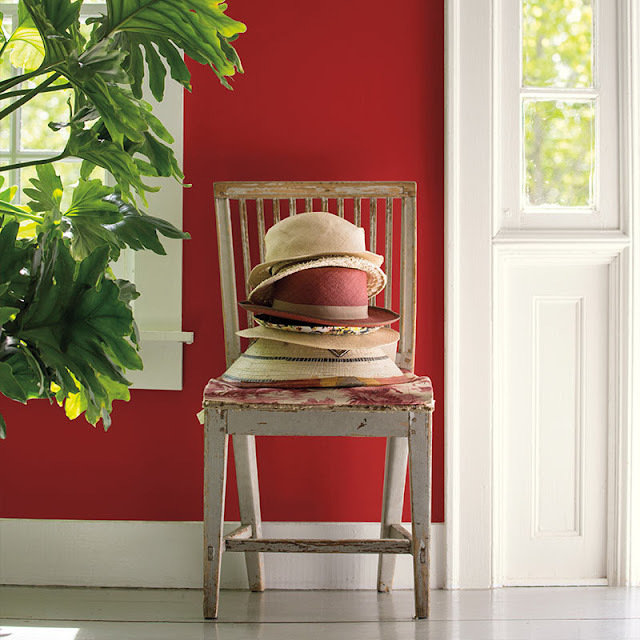 Another color of the year here, Caliente will liven up any space. See more of this color HERE. Benjamin Moore Hale Navy is a great complement to the warm wood floors and crisp white tiles and upper cabinets in this classic kitchen. See more of this color HERE. 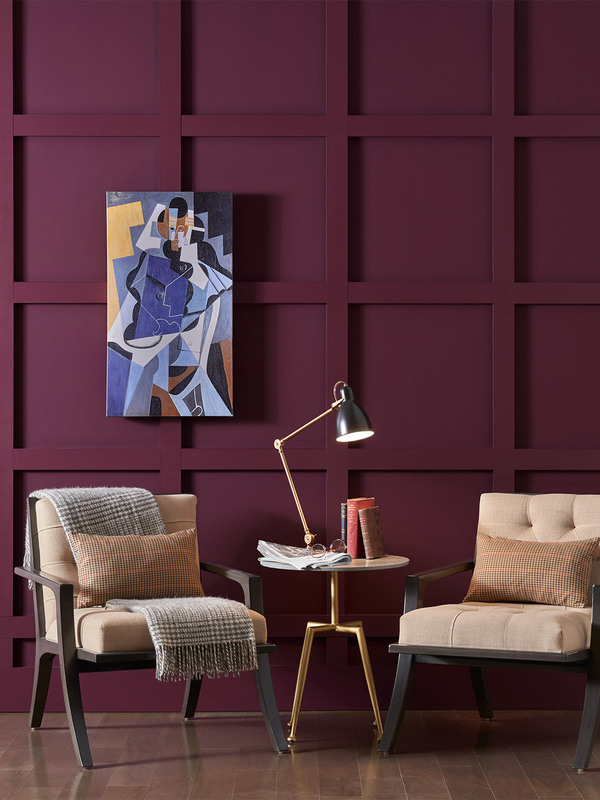 This 2018 color of the year for Valspar has a vibrant rich hue and would work in any space. Favorite Green looks perfect with the wood floors in this space. For a deep, warm neutral you might consider Benjamin Moore Incense Stick. It will go with almost any color and contrasts beautifully with the white trim in this room. Pratt and Lambert's 2018 color of the year would be perfect for a restful bedroom, but also works great for any room in the house. 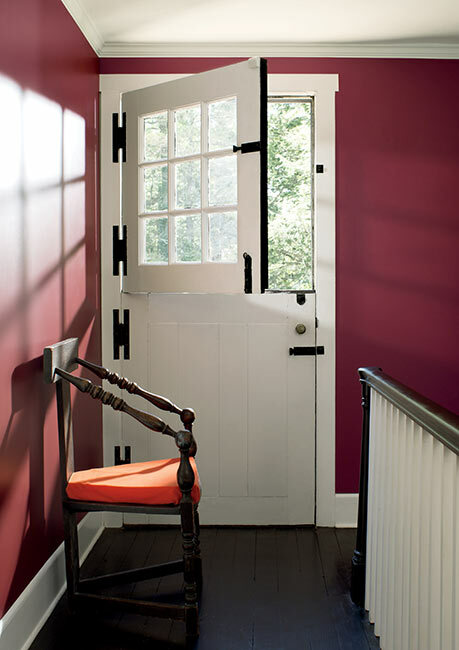 Reminiscent of the 90's jewel tones, Sherwin Williams Merlot adds a bold richness to the walls in this space. 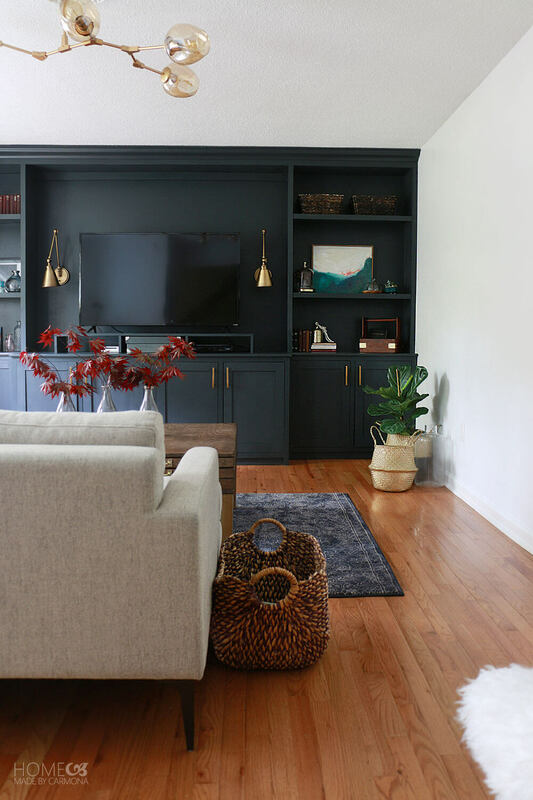 Continuing with the dark trend, Glidden's 2018 color of the year, Deep Onyx, really makes a statement in this modern living room. It anchors the space and provides a nice backdrop for the artwork. 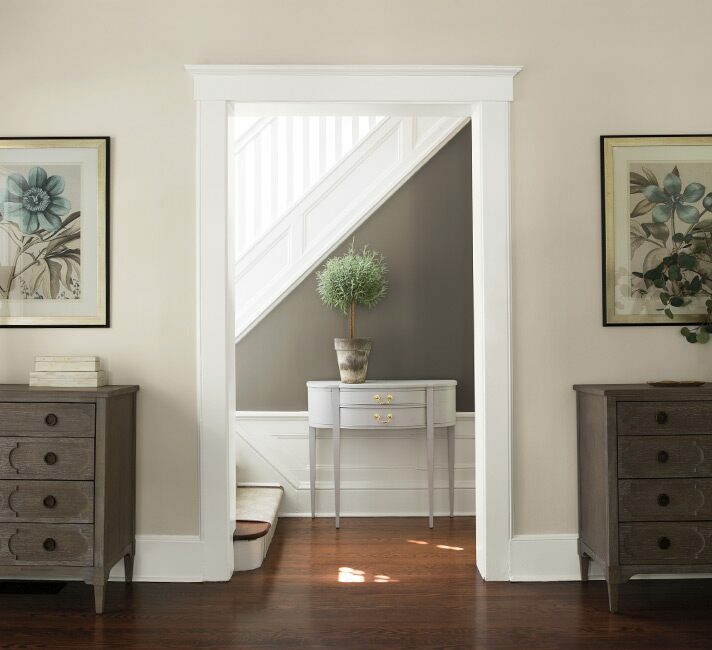 As part of the Colonial Williamsburg Collection from Benjamin Moore, Carter Gray is a wonderful deep neutral that works with almost any color. For adding a warm, deep neutral that isn't too dark, Benjamin Moore Chelsea Gray is a great choice. It works well with warm or cool colors. See more room with this color HERE. Isn't this office space from Danielle at Finding Silver Pennies stunning? 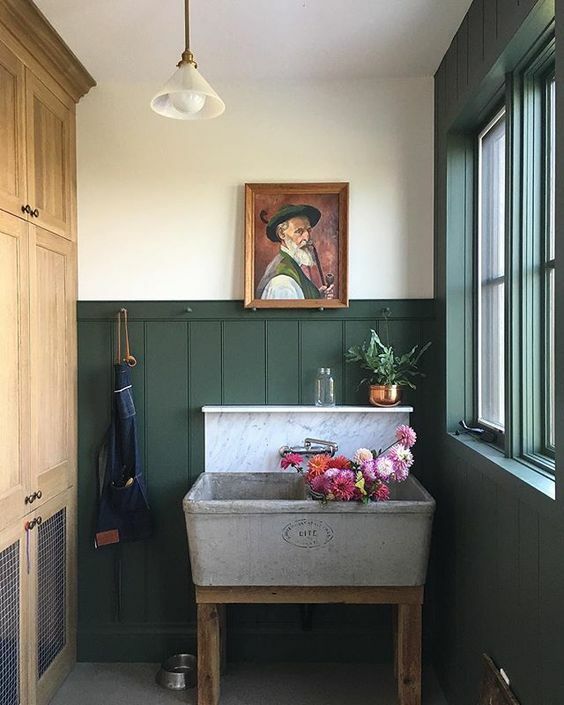 She painted the walls with Benjamin Moore Century Seraphinite and it looks beautiful with all of the warm wood tones. Her light fixture is perfect in here too. 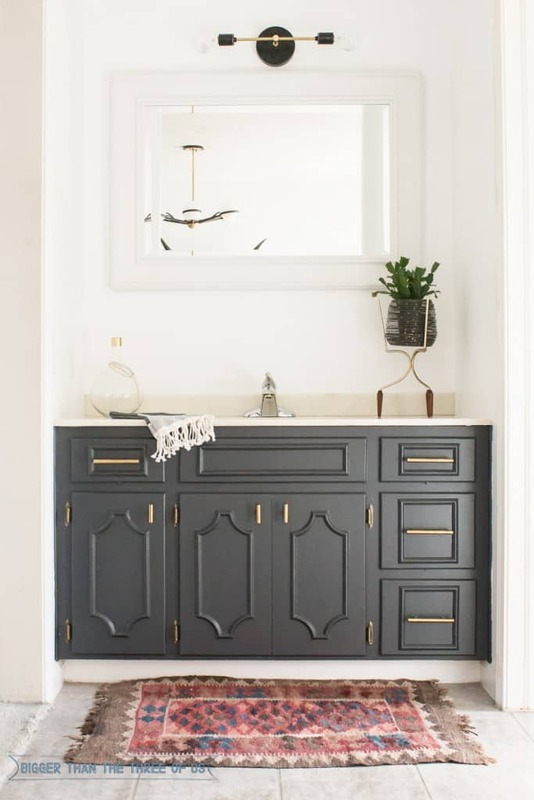 Liven up your laundry room with some dark paint. Amanda at Sincerely Marie Designs painted her laundry room cabinets with Benjamin Moore Backwoods and they're gorgeous! 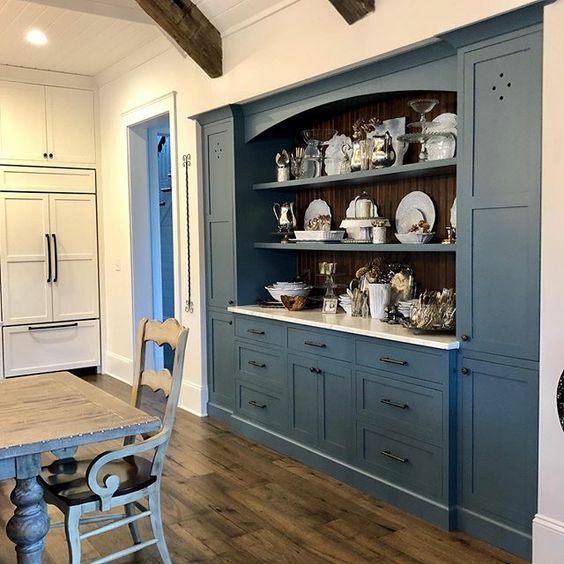 Jodi at farmhouse on cedar creek painted her built-in kitchen with Sherwin Williams Labradorite and it loos so pretty. I love the way she has it styled too. Lucy at Craftberry Bush recently painted her fireplace and built-ins with Canadian Tire Midnight (Benjamin Moore Midnight) and it's so pretty. Her baskets and stacked wood add such a nice texture to the space. Her entire home is beautiful. 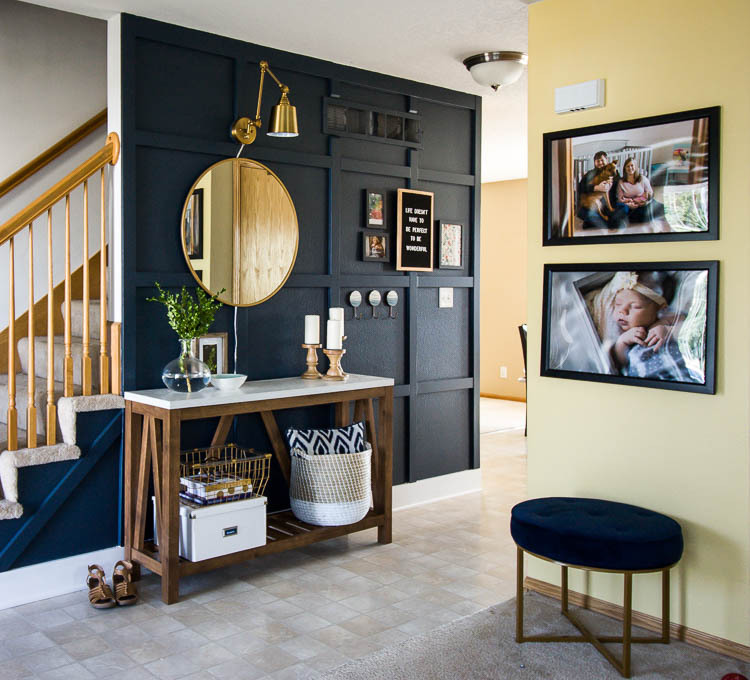 Emily at Small Stuff Counts painted an accent wall in her home with behr midnight blue and it looks amazing. The brass and wood accents really pop against it. Isn't this kitchen dreamy? Ashley at Bigger Than The Three of Us ripped out their old kitchen and it now looks like this. They painted the cabinets with Behr Cracked Pepper. Those brass handles look great against the paint color. 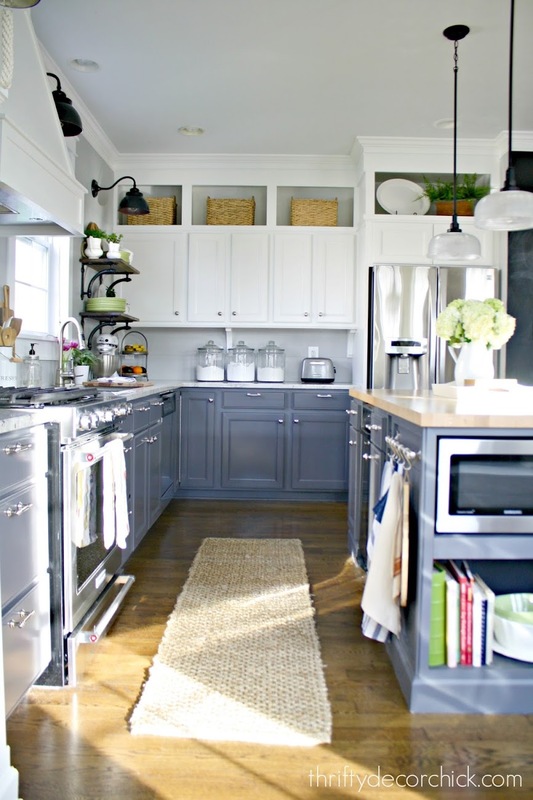 If you don't want to completely overhaul you kitchen, update the cabinets with a coat of paint. Amber at Amber Oliver used Benjamin Moore Mohegan Sage on hers and they look so good. 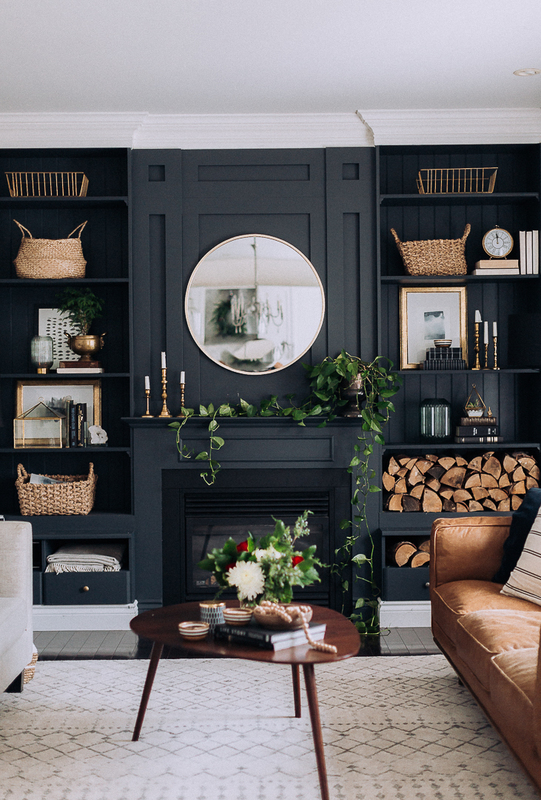 Create some drama in your home with Behr Marquee Satin Black. Ursula at Homemade by Carmona painted her built-ins this color and it really makes a beautiful statement. Don't you love this deep green? Angela at building walnut farm painted her walls with Benjamin Moore Backwoods and it so classic and pretty. Here's a fun little project by Bre at Rooms for Rent. She made a thrifty wet bar area and painted it with Valspar Boughs of Pine. 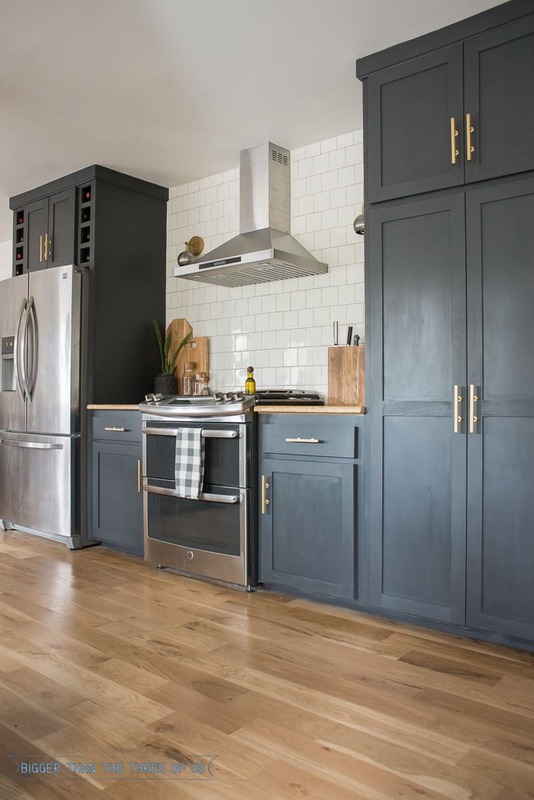 If all white cabinets are too sterile for you, consider painting the base cabinets in a darker color like Sarah at Thrifty Decor Chick. She used Sherwin Williams Peppercorn and it looks so nice in here. Jenna at Rain on a Tin Roof also painted her base cabinets in a contrasting color and it looks phenomenal. 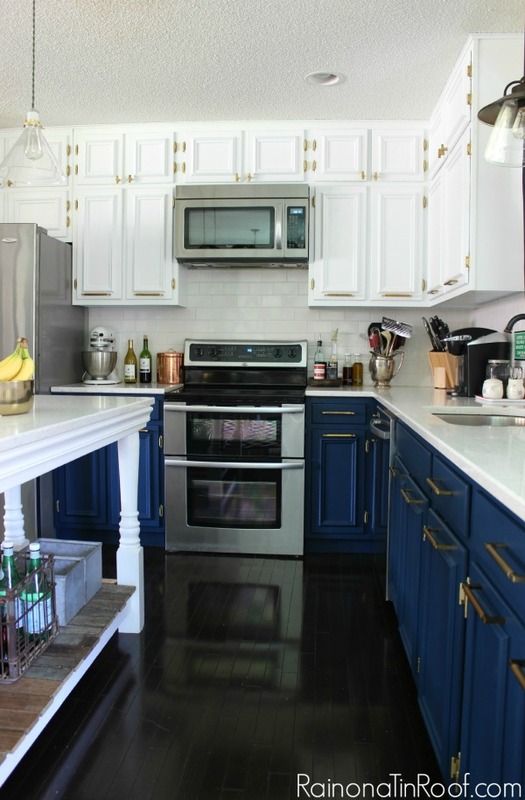 She used Velvet Finishes Handsome for her cabinets. 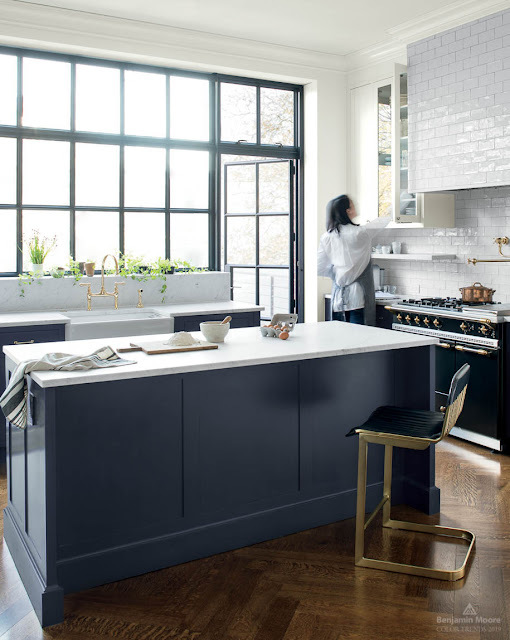 For a pop of color in the kitchen, think about painting your kitchen island in a deep color. Rachael at This is our Bliss used Benjamin Moore Hunter Green and it makes a big impact in here. 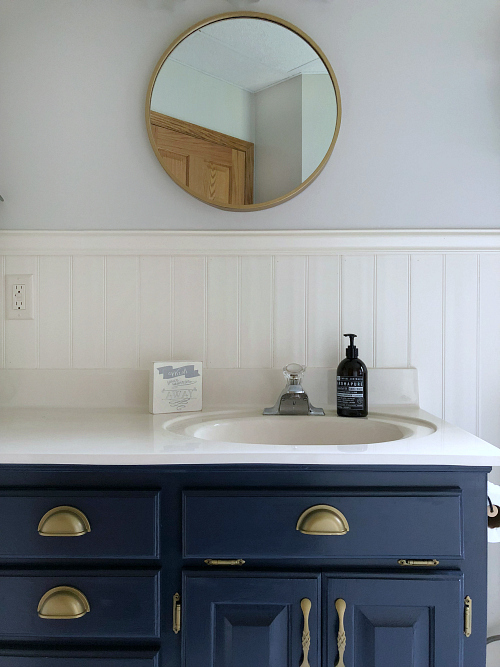 Did you know you can paint your dated bathroom vanity for a quick and easy update? Julia at Tag & Tibby painted hers with Sherwin Williams Peppercorn and it looks like a brand new vanity for a fraction of the cost. Ashley at Bigger Than The Three of Us gave her vanity a similar update using Behr Cracked Pepper. Those brass handles look great and the vintage rug is awesome. painted hers with Benjamin Moore Hale Navy and added brass pulls for a classic and stylish look. 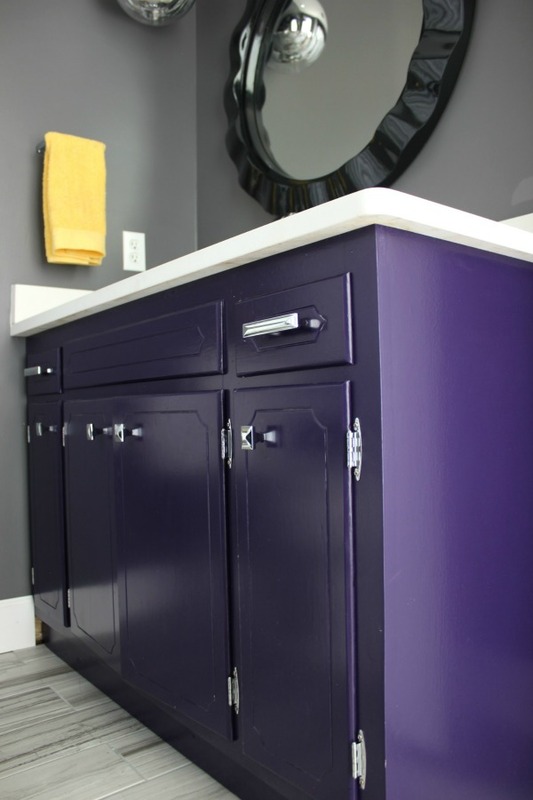 Behr Artistic License was used on this bold vanity belonging to Jenna at Rain on a Tin Roof. It adds so much character to the room. 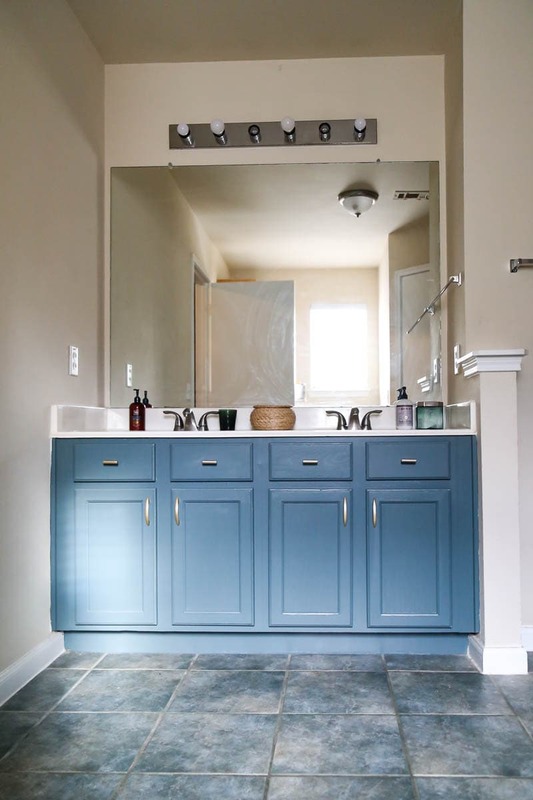 Casey at House by the Bay Design saved money on her bathroom remodel by using her existing vanity and updatin it with Benjamin Moore Tucson Teal paint, new hardware, sink and faucet. It looks like a brand new piece for a hundreds of dollars less than a new vanity would cost. Here's another budget-friendly bathroom vanity makeover. 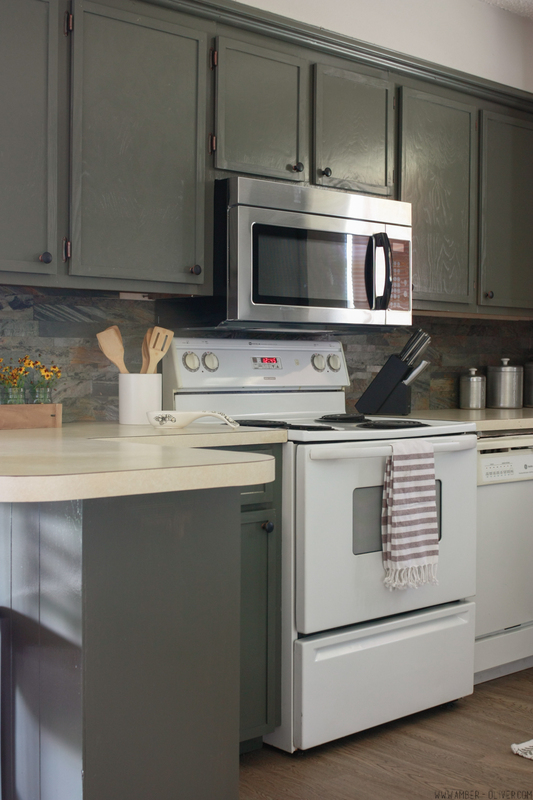 Amanda at Love and Renovations painted hers with Rustoleum Gray Harbor and it looks great! 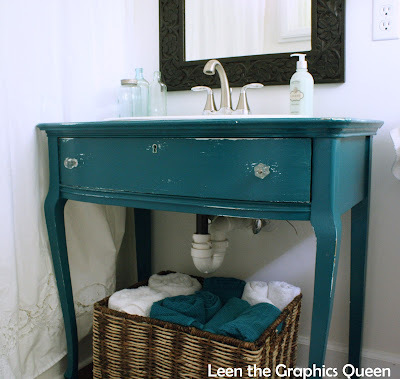 Here's a creative bathroom vanity from Leen at Sand Dollar Lane. They converted a small desk into a vanity and it's so charming! She painted it with Valspar Gypsy Teal. 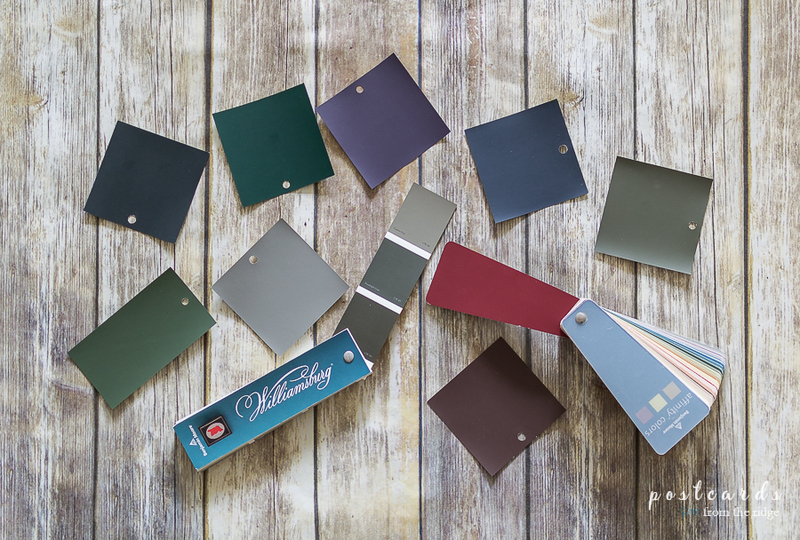 I hope you've gotten lots of ideas for adding deep paint colors to your home. If you've got a favorite, let me know in the comments below. I always like to know what paint colors are popular. Just released in January 2019! 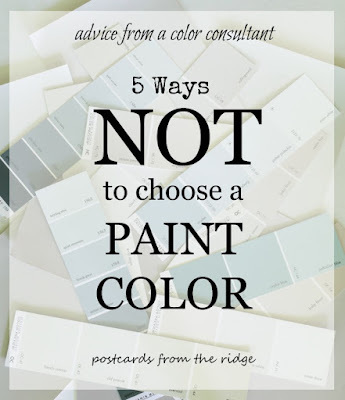 Find out how NOT to choose a paint color HERE. Pin this handy chart for future reference. I am so glad to see that color is coming back into vogue. I'm tired of all white rooms! So much for inspiration here, Angie!! It's got me seriously considering painting our base kitchen cabinets with a great pop of color. Now I just need to decide which color!